JapanNext this month has introduced its new 35-inch ultrawide curved gaming display. 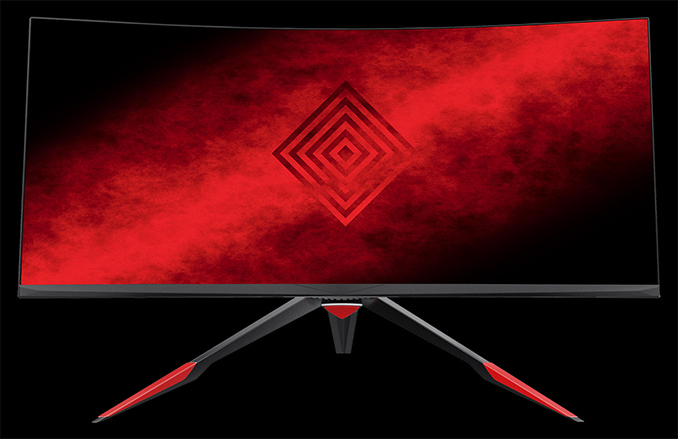 The tounge-twistingly named JN-35VCG200UWHD features a 2560x1080 "UWHD" resolution, a very low response time, as well as a FreeSync-enabled dynamic refresh rate of up to 200 Hz. The combination of features that the LCD supports is rare, but not particularly unique, meanwhile a good thing about this product is that it is more than 30% cheaper than its immediate rival. The JapanNext JN-35VCG200UWHD is based on a 35-inch AMVA3 panel with a 2560×1080 resolution, a 21:9 aspect ratio and a 1800R curvature. General specs of the monitor are fairly standard: 300 nits brightness, 2000:1 contrast ratio, 178°/178° viewing angles, 16.7 million colors, 3 ms response time (grey-to-grey), and so on. The key features of the display are AMD’s FreeSync dynamic refresh rate technology as well as the LCD’s massive 200 Hz refresh rate particularly welcome by gamers. JapanNext does not officially disclose the FreeSync range for the monitor, but I wouldn't be surprised if it was between 30 and 200 Hz, thus supporting low framerate compensation feature (LFC) and offering smooth gameplay across different genres. To actually hit 200 Hz at 2560×1080 owners will need to use a DisplayPort 1.2 or an HDMI 2.0 input. Meanwhile, to maintain compatibility with legacy PCs, the JN-35VCG200UWHD also has a DVI-D connector. Since owners will likely use their 35-incher with multiple PCs at once, the LCD also supports PiP and PbP capabilities, but only at 60 Hz. Since the JapanNext JN-35VCG200UWHD is aimed at gamers, it comes in a chassis featuring an aggressive design with red inlays and 1-cm bezels to make it easier to assemble a multi-display setup using two or three monitors. Furthermore the LCD supports various presets for different types of game genres. The only direct rival of the JapanNext JN-35VCG200UWHD is the AOC AGON AG352QCX, which was released in late 2016 and has similar features. In fact, the LCD from JapanNext has a slightly better panel and a lower response time. The JapanNext JN-35VCG200UWHD display will be available in Japan at an MSRP of ¥89,980 ($808), which is 32% lower than $1,185, the price of the AOC AGON AG352QCX at Amazon. As an added kicker, for a limited time JapanNext will offer the new ultrawide display at a discounted price of ¥69,980 ($629). Considering the unique combination of features offered by the monitor, it is unlikely that JapanNext needs to sell it at a loss just to attract attention of early adopters. 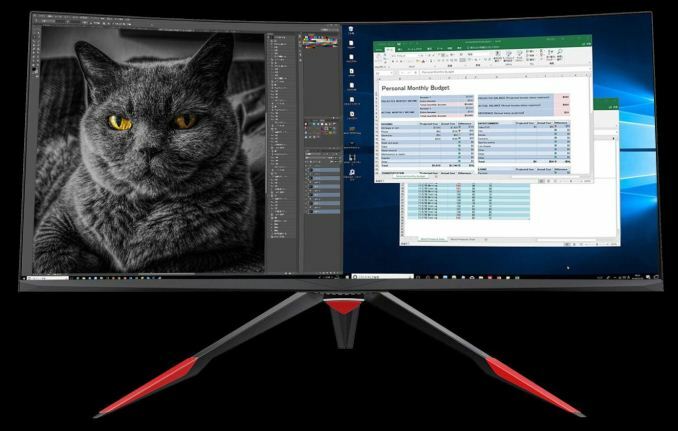 That being said, it looks like 35-inch ultrawide curved display with WFHD resolution and an up to 200 Hz refresh rate have a lot of room for price reductions. I think it's more that 1800R is the tightest curvature that panel makers can do today. Ideally R700-1200 would cover the range of typical sitting distances used by PC users. Yep I also game and do my every day Windows tasks on a 60" Samsung TV. I personally like it since I can sit across the room from it on the comfort of my couch and just blast away. When I first hooked this up to my game system I was worried about latency lag or whatever it's called. I tried the game mode but that was pretty bad it was not a great picture for doing anything except games. Same. The only thing we don't get with these TVs is faster refresh rates and variable refresh. I'm so proud of my 43" LG, it doesn't cost much but the value is through the roof vs monitors. HDR is decent. "it is more than 30% cheaper than its immediate rival."